Saniflo Sytems UK, and their sister company Saniflo Sales Ireland, are leading official distributors in the UK and Ireland of the innovative range of Saniflo macerator pumps, grey water pumps, and condensate pumps. These open up a world of plumbing possibilities that would otherwise be impossible due to lack of access to suitable outflow pipes. Examples include installing a new WC under a stairs, converting a walk-in wardrobe to an en-suite bathroom, and placing a washing machine or dishwasher in a new location. An existing website was not delivering the return that their prices and customer care deserved, so they approached us to fix that. We decided upon a dual-site strategy – one of the UK, and one for Ireland – with the emphasis on the UK first, because of the larger marketplace and greater potential there. Market research first saw us discover that the online marketplace for Saniflo products in the UK is huge – and extremely competitive. 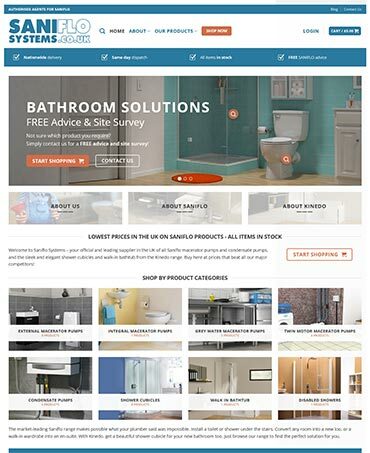 A host of competitor websites were already also offering the full Saniflo range, many at broadly similar prices to our clients, and so we needed something to stand out from the rest. It was obvious however that all those competitor sites were unattractive and unengaging, with product listings comprising nothing more than a single image and some bullet points lifted directly from the manufacturer’s brochure. We determined that our strategy would be to deliver a website to stand apart from the rest, in terms of appearance, content, and overall user experience. This would draw in all potential customers, who would be impressed by the sheer professionalism our site represented, and who would choose our clients ahead of the rest. Our copywriting and content creation department first got to work on crafting content for product pages that is far more informative than the competitor sites, and in compiling all associated content too, such as technical diagrams, installation instruction booklets, etc. We also crafted content for general information pages such as ‘About Us’, ‘About Saniflo’, ‘About Kinedo’, and FAQ, and created compelling calls to action that would be placed strategically throughout the site. Our design and development department then got to work. We implemented an attractive and user-friendly design, with a seamless browsing pathway between the different products to allow the user find the correct choice for them. Our design included paying great attention to the use of colour imagery and ‘lifestyle’ shots of product applications, in contrast to the less appealing images shown on competitor sites. More technical work included both on-page and off-page SEO measures, and advanced e-commerce functionality, as many products have variations to choose from. e-commerce measures also included full stock control system integration, SSL certification for secure online shopping, and Stripe payment gateway integration. Our clients – having expected something similar to the rest – were blown away by what we delivered. We have agreed a full Digital Marketing programme going forward, and are now also working on the website for Saniflo Sales Ireland.